In my game, Andrew seemed determined to lose on time despite having the better position. 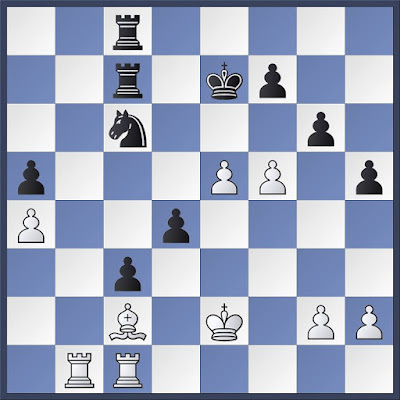 I was 30 minutes ahead, but despite this, on both moves 56 and 57, I missed a mate in one with Rxh2#. Ay Caramba! Good wins for both Richard and Bill. A good result at home for HA2. 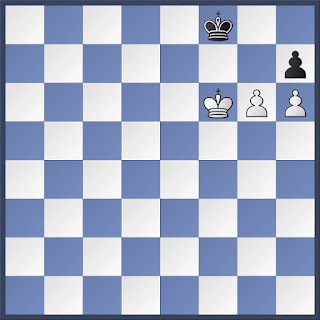 The outcome of the game on board 3 was decided by the clock with white to move in the position below. The start of the new season has seen a welcome return of our club night with plenty of casual games going on. On Sunday 15.10.17 Ray, John and I competed in the latest version of the Atkins. This was a six round Rapid Play Swiss held at Leicester Grammar School in Great Glen. This was a nice venue and there was a decent turnout. Time control was 20 minutes plus 10 seconds per move from the start. One of the highlights was Hebden (with White) K+Q+P winning against Dong K+Q in a game that lasted around 50 minutes. I was very pleased to jointly win the Minor with 5/6. On Tuesday, I was drafted in as a sub for HA1 against a seriously strong Syston 1 team. I opened with the Ruy Lopez. Black played 8...d5, a move known as the Marshall Attack. The idea of the Marshall is that black sacrifices a pawn for development and then throws everything at White's kingside. This was the first time that I had faced it. My queenside pieces became trapped and I did not get time to untangle them and bring them into the game. Some homework required. Graham B was a pawn up, but running short on time. He had at least a draw, but then made an error (I made the same mistake as I played along in my head). Market Harborough were also playing Syston 3. I watched a very exciting finish between Ian Clarke and Ben Pourmozafari. Ben had over 30 minutes in hand to Ian's 2 minutes, and eventually seconds. Both sides were pushing pawns towards the end of the board. It ended with Ben's King jumping around six squares into a corner out of harm's way. It is the Atkins Rapidplay Tournament this Sunday. Ray was also present as a supporter. The match was perhaps not as one sided as the score suggests. Gordon played well on board 4 and he and Steve were the last to finish. Against me, Guy missed a win with 42...Qe1+ picking up the Bishop. I was so relieved that he missed this, that I offered a draw following my next move. My best hope was Qf8 followed by Qg7#, but getting the time to make these moves was far from certain. I am not around on the 10th, so John Oliver and I played our 4th round Minor game at the Heathcote Arms on Tuesday. Ray came down to watch. Harrod Cup Third Round & County Champs Third Round. Following wins in the first two rounds, we faced a perfectly selected 500 grade Ashby team on Tuesday. It looked very much like we were going to lose until John pulled off a quite excellent save with only seconds left on his clock. On Thursday, several of us were in action in the CCs at Wigston. Ray beat Gordon. Bill lost. Graham S won. I beat John McKiernan, who I last met in the play off for last year's Minor. Ray then lost too. John won, but then Mike was in time trouble in this position with the black pieces. Mike took the pawn on g6 and lost to h7 - it cannot be stopped. Can you see anything better for black? Tuesday, we are home in the Harrod against Ashby and on Thursday it is the County Championship. In Round 2 of the Minor, Bill and I were drawn against each other. I am not around next week, so we played our game early. I was up against it in the middle-game, but hung on. After white's 23rd move, we were equal on material and Bill offered me a draw, but by then I felt I had the edge and was able to convert the point. Afterwards, we watched the exciting 0 - 1 conclusion of Graham Sharpe Vs Shabir Okhai in the Open. Graham B was around too, playing Sherif Gonem, but I did not get to see any of that game. Next Thursday, in the Minor, Ray plays Andy Carter and Gordon plays Paul Martin and John is down to play Jez Wells in the Challengers. We are at the top of the table with three matches to go. Melton 4, Ashby 4 and Braunstone 5 are all within striking distance. 4 matches left now. It is getting a bit tight at the top of Div 5. HA3 had a good evening at Braunstone. The first result in was a loss for Richard with the black pieces. I then beat John Oliver who had lost a couple of pawns early on. The last two games literally went the distance with both flags dropping. 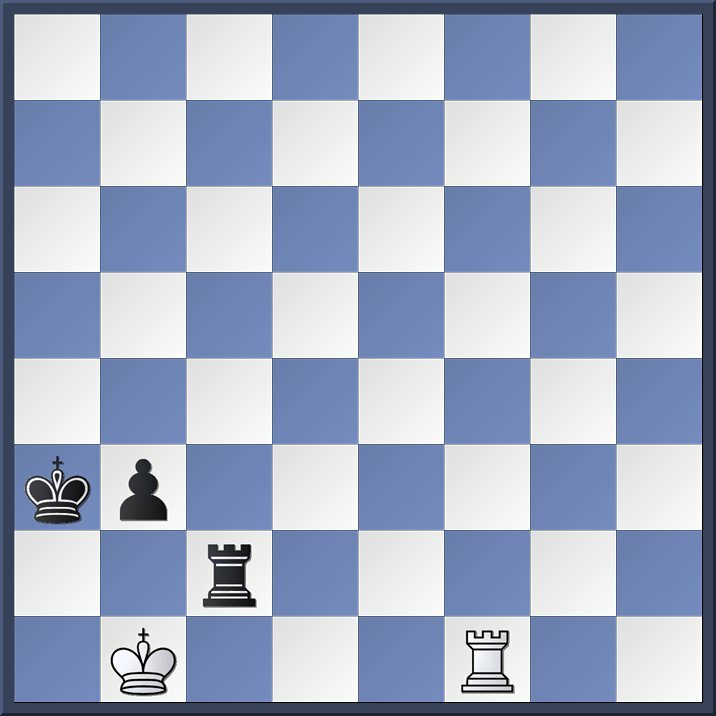 See the image at the end for the final position in Gordon's game. Bill's opponent refused a draw offer when both had only a few minutes left on the clock. We ended with the same result as Leicester City against Liverpool the night before. Here was the final position from Paul and Gordon's game. White to move when the flag dropped. Red Admiral are struggling a bit to get a team out at the moment and, unfortunately they had to default on one of the boards. This gave us a point, but left Gordon without a game. Stan Parsons, with his make them up as he goes along openings, is always tricky to play against and this was too much for Ray on the knight. Bill was victorious with his opponent having refused an earlier draw offer. Mick made me work for it, but I was able to recover a win. Amazingly, this result leaves us at the top of the table, whereas usually we are glued to the bottom of it.